Jesus said, "Go into all the world and preach the gospel". This is the Great Commission He gave to His church. Grace Baptist has endeavored to carry out this commission since the beginning of the church over thirty years ago and because of this we have seen many blessings from the Lord. 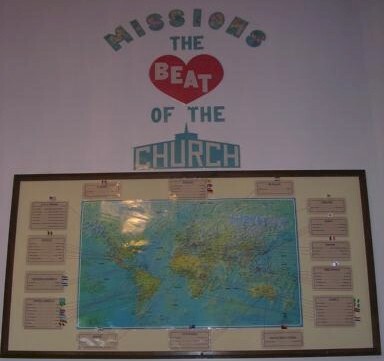 The slogan, "Missions-The Heart Beat of the Church" has been adopted so we will remember to keep first things first. Truly, mission work is the heart beat of Jesus. He came to save sinners and told His church to go and tell the story of salvation to the world. The mission endeavor of Grace Baptist Church reaches north, south, east and west as we partner with missionaries in the regions beyond. We support families and projects which are resulting in the salvation of souls from many different parts of the world. When people get saved, churches are started to do the same thing as we do here, which is to "go into all the world and preach the gospel". To God Be The Glory!!!! As another part of our love for missions we built a three bedroom missions apartment for missionary families to use while with us or with other churches in the area. Missionaries needing the apartment can call the church office at 270-322-3381 to see if it is available. This apartment has been a real asset to the church and the missionaries. There have been many from the membership of Grace Baptist Church that has been called into ministry. Some have gone into pasturing churches while others have surrendered to go to the mission field. We currently have four families from our church serving in various parts of the world. The Ronald Downey Family, The Solomon Owolabi Family and The Leo McElroy Family and the Dustin Taylor Family.